Born (an Aries,) 1941 and raised in New York City until the age of 10 when my mother remarried and we moved to Washington, D.C. I attended Gordon Jr. High School and graduated from Woodrow Wilson High (1958). I began working for the National Institute of Mental Health (NIMH) during the summers of 1960 and 1961, at the new Mental Health Study Center in Adelphi, Md. This was a "pilot project" model for what were later to become Community Mental Health Centers. Graduated from Vassar College (1962 ) and, after spending a summer in Mexico City, entered graduate school in Anthropology at the University of Pittsburgh. I immediately discovered that I was not cut out for an academic life; there is a BIG difference between undergraduate mind-expanding enthusiasms and the mind-bending toil of becoming responsible for the full body of knowledge necessary to the professional scholar. I left, after finishing one face-saving trimester. Remained in Pittsburgh working at Carnegie Tech and happy to be free. Returned home to DC that summer and did some volunteer work for the new Peace Corps; then took off for my no-agenda/no-strings first trip to Europe. After three months of traveling, I found my way to Israel where I remained for a year, studying the language, living with an Israeli sculptor and working for a cultural anthropologist. The job was a real piece of luck, affording me the opportunity actually to try my hand at "field work" - doing interviews with recently arrived Kurdistani families. I was miserable! Unable to retain the necessary "distance" I felt that my intrusions were not outweighed by the importance of that particular "quest for knowledge". Keeping a low profile, I learned, is simply not my style. Came back home in 1965, married the Israeli sculptor, Matti Reatig, (which lasted about five years - divorced 1971- good times and no regrets - ), and found a job (again) with NIMH. As an Anthropology major, I had focused on the sub-area of "culture and personality" and had always been interested in the ways in which different cultures define and deal with "deviant" behaviors. I hoped to find a way of merging these interests through research which sought to identify etiology and treatments for "mental illnesses". As a research assistant in the then newly emerging field of Psychopharmacology, I had a fascinating opportunity to observe the tremendous conceptual changes which occurred as the science moved from "nurture" back to "nature" - from psychological to biological theories. Remained for 20 years with the "Psycho-pharm..." moved up and eventually became responsible for programmatic administration of the research grants on pharmacological treatments for "special populations" - Attention Deficit Disorders, Anorexia Nervosa/Bulimia, Autism, and persons with dual diagnoses of Mental Illness/Mental Retardation. During the late sixties and seventies I threw myself whole-heartedly into the civil rights, anti-war, and feminist movements, both in- and outside of NIMH. There was a lot of "heavy action" in those days - and I wanted to be in the thick of it! I served on the NIMH Minority Affairs Committee, and the ADAMHA Women's Council and was one of the organizing leaders of the Vietnam Moratorium Committee at NIH/NIMH (1969-1973) which sponsored monthly (!) "educational" meetings and protest demonstrations. Later I was a founding member of Federal Employees for Peace and The League of Federal Voters, the latter sponsored debates during the 1974 elections with representatives from all candidates on the ballot (we needed to be completely non-partisan!) ... I'm sure that was the first - and last - time that officials of the American Communist and Socialist parties were seen at a Federal building! By the mid-eighties, psychopharmacology had become psychiatry, and the powers-that-were determined there was no longer a need for a specialized Branch within the Institute. In considering the new emphasis upon biological expertise, which I didn't have, I decided to find a new arena in which to operate. Fortunately there was an opening in the reorganized Institute's Division of Education and Service Systems Liaison. I jumped out of the ivory tower of research and fell, splat, unexpectedly, into the harsh and often brutal realities of the mental health service delivery system and its institutions. Fast gone were the rosy ideals of enabling the "logical" progression of research findings into "enlightened practice"; the political environment had changed and the budgets of Federal and State programs alike were shrinking. I worked briefly with the Program for the Homeless Mentally Ill and then the BIG DREAM JOB suddenly appeared. In 1986 Congress passed "The Protection and Advocacy for Mentally Ill Individuals" Act and I was named director of this new NIMH program. I could never have imagined working so hard and loving it so much. I realized that this, finally, was the kind of work I had joined the public service sector to do! This $20+ million program provides grants to Protection and Advocacy Systems in each state to advocate for and protect the rights of individuals with mental illness in residential facilities and particularly to investigate allegations of abuse and neglect. The P&A community is wonderful; it is a field in which at least half of all executive directors are women, and it involves dealing directly with lawyers, case-workers, consumers/survivors and family members. The legal, political and ethical issues are right on the cutting edge. I am very proud and to have been part of this new civil rights movement, one whose time is long overdue. I live in the ethnically diverse Adams-Morgan neighborhood of downtown Washington, D.C. where I hosted weekly "Salons"- informal gatherings of artist friends and other creative beings - regularly on Wednesdays, (1976-1997). It began at Columbia Station, then moved to Café Lautrec, The Biltmore Bar, Café Riche, Bradshaws and finally Chief Ike's Mambo Room. 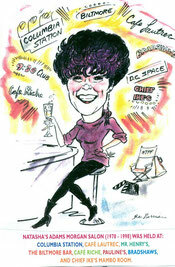 In the late '70s I embraced the emerging new-wave/art/punk/avant-garde "scene" in downtown D.C. and started hosting parties at late-night hang-outs (dc space, The 9:30 Club, The Bank Nightclub) in support of artists, musicians and other performers. Many parties were hosted there. In 1989, I produced a short experimental video entitled "Never Trust A Pretty Face", a black & white, silent, melodrama set in the 1920's, which was exhibited at the D.C. International Film Festival and numerous other festivals around the country. In 1991 I co-founded The ROSEBUD Awards, an annual tri-State film and video competition honoring work that is innovative, unusual, experimental or deeply personal. I served as Executive Director from 1994-20001. ROSEBUD is currently run by Arlington Independent Media, Inc.. I served as the President of First Shot Productions, Inc., (1991-2001). a non-profit, tax-exempt arts promotion organization which sponsored ROSEBUD as well as other general entertainment events featuring DC area artists. See Rosebud interviews on "On The Cutting Room Floor" and at "Chief Ike's Mambo Room." In my retirement years I now live peacefully and happily in the house my mother left to me in Bethany Beach, DE. I spend the winter months (December through March) in my DC Adams Morgan condo. I read avidly in ancient history, with special focus on the nomadic tribes of Central Asia; I walk, do yoga, ride my bike, and do some volunteer work for the Delaware Democratic Party. See 50th Birthday Tribute Video. 1965 - 1985 Research assistant, and later, Grants Program officer - Psychopharmacology Research Branch, National Institute of Mental Health. A non-profit 501(c)(3) arts-promotion organization sponsoring events to introduce DC-area arts and artists to wider audiences. Public Responsibility in Medicine and Research, Boston, MA Member, Board of Directors (1984 - 1995) Education for ethical, legal and regulatory considerations in protection of human subjects in Federally funded biomedical and behavioral research. Applied Research Ethics, National Association, Boston, MA Co-Founder, Member (1984 - 1995) Professional Association for those involved with review of human subjects’ protections in Federally funded biomedical and behavioral research.